This practical tray has many uses in the shed, greenhouse, or even kitchen! Its high sided walls keep compost inside the spacious working area, allowing you to transplant without making a mess. It also comes complete with a useful three-sectioned shelf which rests at the rear to hold all your bits and pieces. Made of tough polypropylene with generous dimensions: 61 x 56 x 20cm (24 x 22 x 8"). 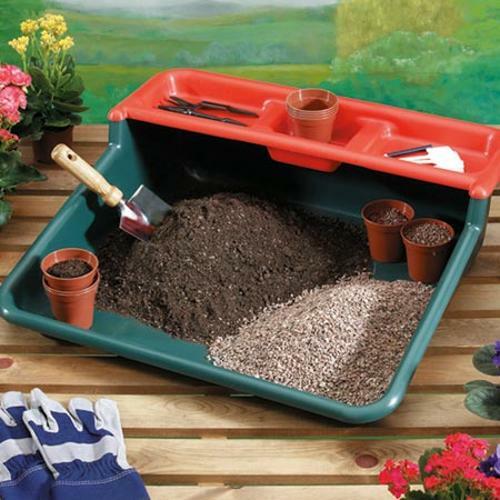 Use in the home or garden, comes with a detachable shelf! This so useful. I don't have a potting shed, but this tray fits perfectly on the worktop in the utility room. It's easy to clean and stand on end when not in use. Saved a lot of bother all round.